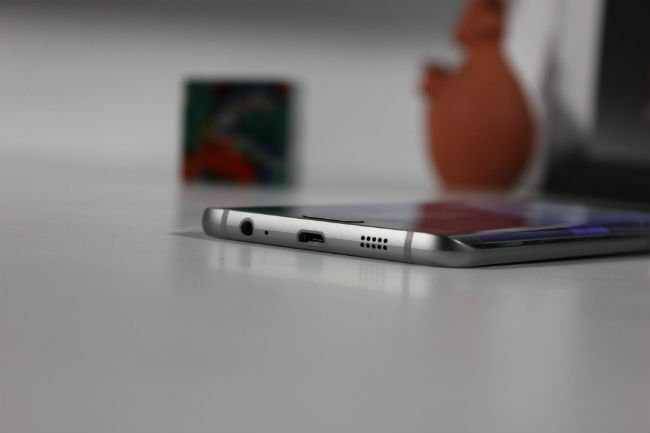 If you are looking for a state of the art Android smartphone, the Galaxy S6 Edge Plus is the one for you. It has a brilliant camera and display along with good battery life. 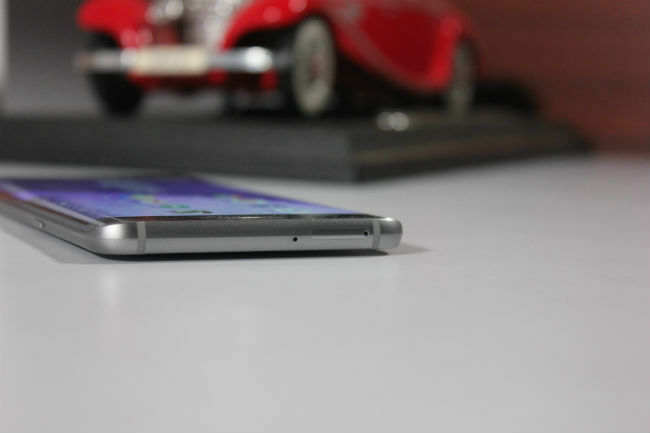 The curved display has little utility and the smartphone feels fragile. If you want a smartphone that will turn heads wherever you use it, then this is the flagship for you. They say that to be the best you need to ape the best. For years, Samsung has blatantly copied features that have defined the iPhone and tried to improve upon them, and yet managed to miss the mark with its sub par build quality, childish TouchWiz icons and lacklustre overall appeal. Over the years, Samsung’s Galaxy S series have defined themselves as the go to devices for a flagship Android experience. 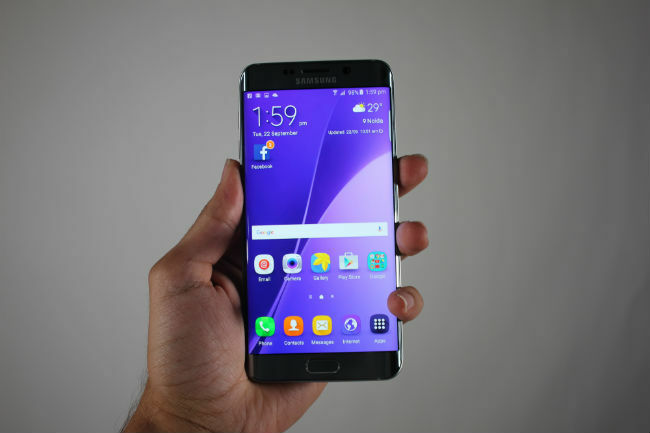 In the past two years, Samsung has worked at adding another element to its flagship line-up – style and that is what the S6 Edge Plus is. It’s a style statement, a statement that says I am the best there is and what I do is better than the rest. Samsung doesn’t need to ape the best anymore. But is it the best? Samsung’s flagship devices were notorious for being plasticky and Samsung changed that with the Galaxy S6. And there was no going back. 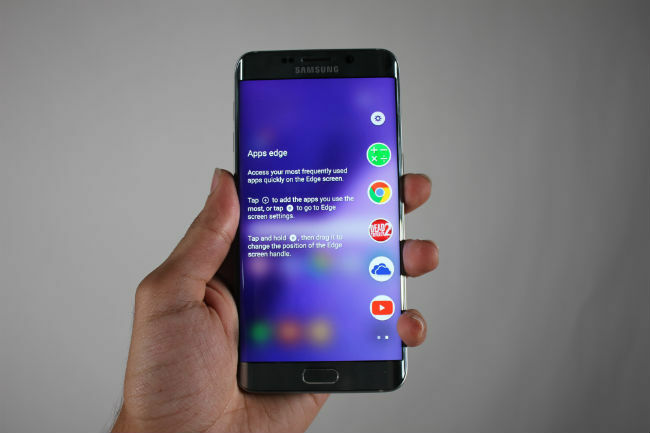 Coming to the phone in question, the Galaxy S6 Edge Plus, the device has a design very reminiscent of its sibling, the Galaxy S6 Edge with the biggest difference being that the smartphone has a larger display, which is curved on both the sides. There is a larger battery and more RAM as well, but that’s all under the hood. This gives edge-to-edge design a whole new meaning and feeling when holding it. Hold the device for the first time and you will feel odd, very odd. Usually smartphones have a flat display and a curved back. This adds to the ergonomic design of a phone making it comfortable to hold and more importantly making it easy to lift off a table. Here however, the roles have been reversed. 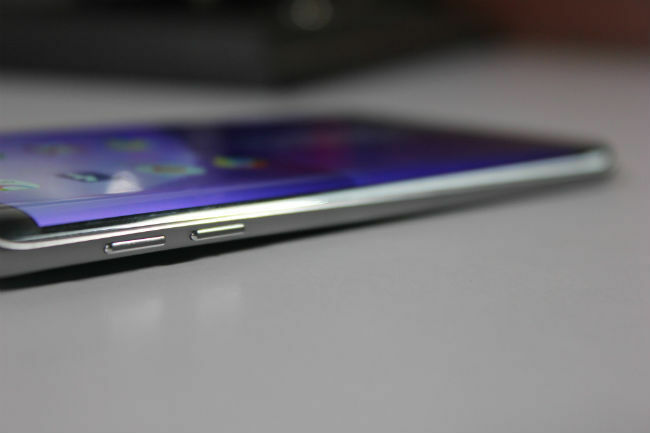 The display of the smartphone feels curved because of; you guessed it, the curved edges. And the rather stiff flat back of the Edge Plus makes it uncomfortable to hold and use at first. Even a simple task like picking up the smartphone from a table feels different because the back is so flat and the curved glass is so slippery that you will have to make an effort to pick it up. Coming to the back, the metal body is overlaid with glass and from the minute you touch it, it is a fingerprint magnet. The rear also houses the camera and that’s about it, clean and elegant. The camera protrudes slightly but that’s ok. The bottom of the smartphone has the headphones jack accompanied by the speaker and the microUSB port. The top has the nano SIM card slot and the right has the power button. The volume rocker rests on the left and considering the small footprint of the borders of the smartphone, the buttons though small are easy to find without looking. Last but not least, we have the front of the smartphone. Sure, here we have the curved display, but below that rests the one physical button which is a fingerprint sensor as well. On either side of the fingerprint scanner we have the multitasking and the back button. Overall the Samsung Galaxy S6 Edge Plus has a beautiful design that will definitely turn heads but at the cost of ergonomics. Boy-o-boy is it beautiful. The 5.7-inch display has a 2K resolution. Yes, for a smartphone a 2K resolution is overkill, but the Super AMOLED display looks stunning. I am currently using a OnePlus One and an iPhone 6 and I can’t go back to those phones. Watching videos, be it YouTube or locally stored videos on the device is a treat. Despite the fact that you can tell the difference between a low resolution and high-resolution video, the low-resolution videos still looked good. And by low-resolution videos, I mean 720p videos. Even pictures that you click from the device or the ones that you view online look awesome. The colours just pop. The only downside here is that the edges are more of a distraction than an addition when watching videos. It’s distracting to see the black bars on videos curve around the display and even more distracting to see the video curve around the display running in full screen. I haven’t used a Samsung smartphone as my daily driver for a long time so coming back to TouchWiz was like meeting a childhood friend after a while, it's still familiar but all grown up. Everything though familiar is a little different. It’s matured. Swipe right on the display and you will see Flipboard integrated that will give you a newsfeed. On a Nexus phone, this is where you’d find Google Now. Sure, Flipboard adds freezes your phone for a second, but it's still something many of us use and find useful. 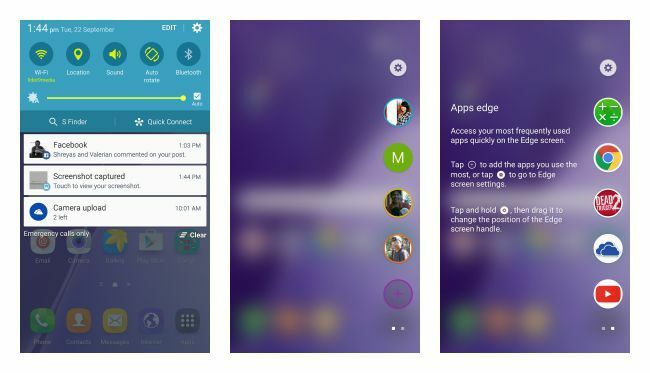 Coming to the rest of the UI, its what you’ve seen on the Galaxy S6 or the S6 Edge. 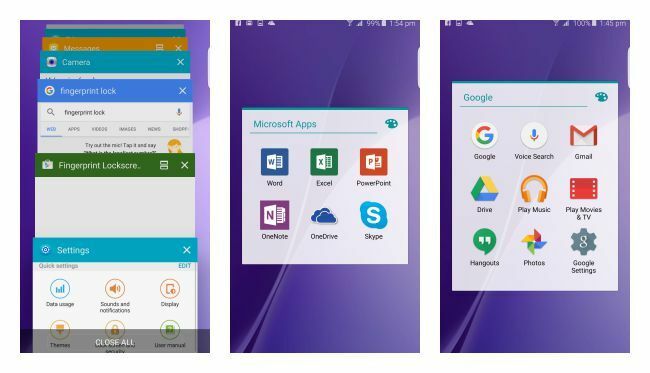 You have the ability to run two apps simultaneously, use the phone in ‘single hand’ mode and more. If you are one that’s used a Samsung phone before, you will feel right at home. Coming to the curves there is no practical use for it. Not yet anyways. Sure, you can see your notifications pop up on the curve or you can simply swipe the right side of the display to bring up your favourite contacts and apps but I can do this by simply installing a third party app on any Android phone. Just like Samsung’s Note devices took a while to define the utility of the S-Pen, we think it will be quite a while before we can justify the utility of the curved display. Yes, swiping to go back is a lot “cooler” and smoother thanks to the curved display but again, that isn’t a justification. Coming to the performance, the smartphone is a beast. In our benchmark tests, the device performed top notch pushing every benchmark to its limit. As an everyday smartphone, the device works quite well too. The call quality is crisp, typing is a breeze, and multitasking is splendid. Its what you get when you are using a device with state of the art hardware. The hardware powering the S6 Edge Plus is the same that is powering the S6 Edge with the difference being the larger screen size on the Edge Plus and 4GB DDR4 RAM (the S6 Edge has 3GB RAM). The EdgePlus also houses a bigger battery. Moving on to the battery life of the smartphone, in our continuous video playback test the device lasted for a whopping 16 hours. We played a 1080p movie on loop keeping the brightness on full and plugging headphones into the device, keeping the volume at max as well. In the GeekBench battery test the device lasted for a little over 9 hours. Coming to everyday use, the device has enough juice to get through a day and if you aren’t a power hungry user, there is enough juice to spill over to the next day as well. The gaming performance again is great. The smartphone ran every game I played on it. The only downside here is the location of the speaker. I would inevitably end up covering the speaker with my hand while gaming, and hence muffling the audio. The speaker on the other hand is nice – loud and crisp. My biggest fear was that the device is so slippery, that I feared I’d drop it. And worse, since the metal body is encased in glass, I feared the glass would shatter. Last but not least, we have the camera. The rear has a 16MP camera that is brilliant. There are some pictures that I clicked in low light and people did not believe that it was clicked in low light. Let the image gallery speak for itself. Put simply, the camera of this smartphone is just awesome. When asked, “which flagship phone I should buy?” I was one that wouldn’t recommend Samsung phones and over the years my opinion has changed, and that should be a testament to the hard work Samsung has put into making its devices great. It isn’t perfect, the curves are useless, the display is awesome, the camera is to die for and the body is fragile and a fingerprint magnet. Nonetheless, if you want a smartphone that is a beauty and a beast, then this is the one for you. It’s the Android phone that cannot only perform but will definitely turn heads wherever you use it. Trust me. I travelled in the Metro in New Delhi with this phone just to see people’s reactions. 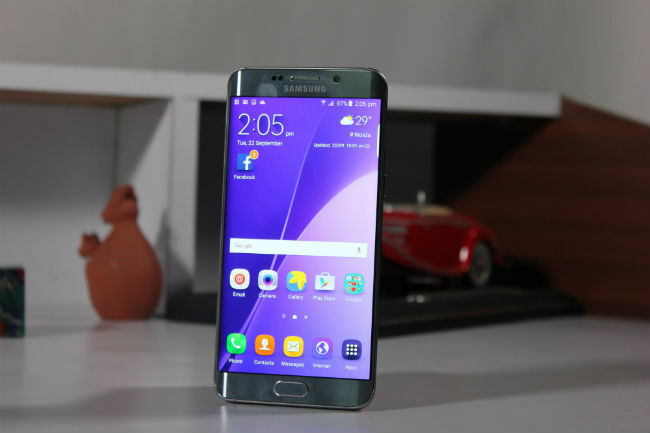 Is s6 edge worthier than the normal s6? 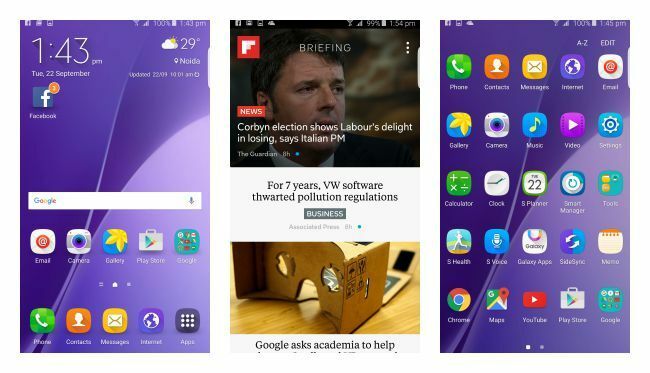 which one is best to buy s6 or s6 edge? Normal S6 , Is there a Samsung Galaxy S6 with dual sim? ?